It is being reported that the recent kidnapping of former Finance Minister and Secretary to the Government of the Federation, (SGF), Chief Olu Falae may have been the final straw that prompted the Nigerian Communications Commission (NCC) bare its fangs and slam a hefty $5.2billion fine on MTN. According to a post from Johannesburg, South Africa, by Matthew Davies, BBC’s Africa Business Report editor, Nigerian authorities were miffed when they found out that the kidnappers, who abducted Chief Falae from his farm on his 77th birthday on September 21, where communicating with his family allegedly with an unregistered MTN SIM. The kidnappers had initially demanded a N100million ransom before the chief’s family was able to negotiate a lower ransom, which they paid. The NCC had repeatedly warned the mobile telecommunication firms to deactivate unregistered SIM cards, which the commission insisted would help reduce crime across the country. However, according to unconfirmed reports, MTN, which is the largest telecoms firm in the country, had failed to de-register about 18million SIM cards on their network. The company has publically said it had ‘complied’ with the NCC directive by deactivating over 5million unregistered SIM cards from its network. The report further says that it is believed that MTN’s chief executive, Sifiso Dabengwa, who was in charge of the Nigerian operations before taking up the top job, has been in the capital Abuja trying to negotiate some sort of reduction to the fine. Meanwhile, MTN said in a statement it was in talks with the Nigerian presidency, internal security agency and telecom regulator to resolve the matter, Reuters reports. “The company reiterates that engagements with the Nigerian authorities are continuing,” MTN said in statement, confirming a Reuters report earlier. 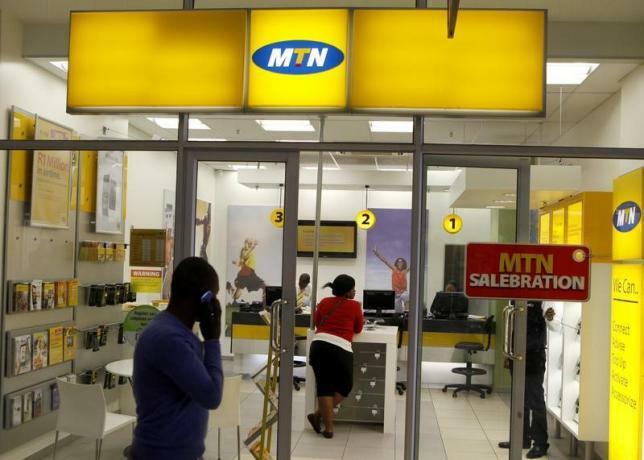 And in a related development, South Africa’s bourse briefly suspended trading in telecoms firm MTN Group on Monday, after the stock fell as much as 8 percent as Africa’s largest mobile telecoms operator battles to reduce a $5.2 billion fine it faces in Nigeria. The stock has fallen more than 25 percent in the past seven sessions, wiping in excess of 60 billion rand ($4.4 billion) off its market value, after the Nigerian Communications Commission (NCC) imposed the fine last week for failure to cut off unregistered users. After trading resumed hours later, MTN shares were down 5.9 percent at 148.51 rand at 1200 GMT. They earlier touched a three-year low of 142.50 rand. One trader said the stock tumbled due to speculation the company had agreed to pay the fine, which is equivalent to almost a quarter of Nigeria’s 2015 budget of $22 billion and would wipe out more than two years of MTN’s annual profits. “There has been some speculation that the company has agreed to pay the fine, but we really want to hear it from the company itself,” said Afrifocus Securities portfolio manager, Ferdi Heyneke. It was unclear what would happen to MTN, whose Nigerian licence is up for renewal in 2016, if the company fails to pay the fine, but NCC’s powers include revoking licences. Some analysts said the size of the fine risked damaging Nigeria’s efforts to shake off its image as a risky frontier market for international investors. Others said the fine showed Nigerian regulators were keen to enforce the law. “Nigeria is stuck between a rock and hard place. It’s an astronomical fine that would not only hit MTN profits but also its ability to invest in network, which is vital to Nigeria’s telecoms infrastructure,” Pater said. Investors also hammered MTN debt with yields on company’s eurobonds soaring to all-time high on Monday. The yield on the $750 million paper due in 2024 climbed to a record 5.975 percent by 0905 GMT, extending gains to 129 basis points since last week. fines? then who will pay it? yes mtn will paid it but we poor masses we pay it back, bcos now mtn will start rubbish by empty ur account. u will load credit b4 u know your credit will disrepair. by hearing sorry you did not have sufficient balance to call this number.nd if u cal customer care wat u wil hear is dat wil ar very sorry dat all.